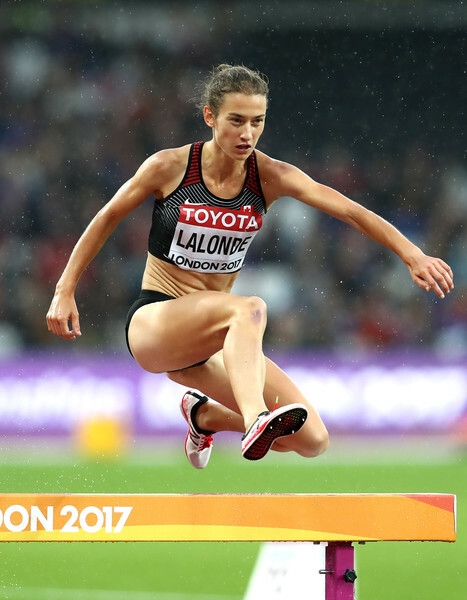 Geneviève Lalonde, of Moncton, will be representing Canada at the IAAF World Indoor Championships in Birmingham ENG, March 1-4. She is one of only 15 athletes selected by Athletics Canada to attend this exciting competition. Gen also has the honour of being the first Canadian team member to see action in the meet as she will be running the 3000m event on the first day of the Championships. She is presently ranked 23rd in the world in this event, having recently run a time that makes her the third fastest Canadian woman in history at this distance. She is, of course, the Canadian record holder in her specialty, the 3000m steeple chase. We can expect a fast time from Gen as she “runs the boards” on the very fast Birmingham track against a world-class field of runners. You can follow Gen and the whole Canadian team online. The meet will be streaming live on www.cbc.ca/sports and live results can be found at www.iaaf.org . Athletics New Brunswick is very excited to announce a great opportunity and partnership with Aboriginal Sport and Recreation New Brunswick. ASRNB is the provincial organization responsible for guiding and promoting a healthy, active lifestyle through developing sport and recreation opportunities for Aboriginal People in New Brunswick, with a focus on youth. They are also committed to assisting athletes, coaches and membership in achieving the highest possible level as a participant and as a person. ANB and ASRNB will be working together to offer Run Jump Throw Wheel Instructor Training to leaders in several First Nations Communities across New Brunswick. ASRNB will be distributing RJTW equipment kits to these communities with trained instructors to offer/implement their newly learned RJTW programming. Participants will include school teachers, community leaders and recreation oriented groups. This partnership will allow the program to grow and expose more youth to the benefits of grassroots track and field programming that encompasses physical literacy and fundamental movement skills. "It is very exciting to have the opportunity to partner with ASRNB on this initiative" said Alex Holder, Director of RJTW for ANB. "The RJTW Instructor Workshop is a great way to get more coaches involved and improve the learning of fundamental movement skills and physical literacy in kids at a young age. We are really looking forward to offering the workshops to First Nations Communities" added Holder. MONCTON, NB – Over 200 university athletes took part in the 2018 Atlantic University Sport (AUS) Track and Field Championships hosted at the University de Moncton this weekend. A total of 9 Atlantic Universities competed for individual titles and team points including several NB universities. The competition saw many great performances across the board including some stadium records and AUS Championships records. Here are the highlights of New Brunswick athletes and athletes representing New Brunswick Universities. - Victoria LeBlanc of Saint John (UNB), won the women’s long jump with a best jump of 5.43m. LeBlanc also made it through to the finals of the 300m and came through with a 5th place finish with a time of 42.93s. - Targetville’s Brianna Forbes (UNB) had a great weekend jumping, finishing in 2nd place with an 11.05m triple jump performance. Forbes also finished 7th in long jump with 4.96m. - Sydney MacDonald (UNB) and Isabelle Morris (UdeM) , both hailing from Miramichi were vying for the top spot in the women’s pent. MacDonald finished in 2nd place with a score of 3255 and Morris in 4th with 3003. Isabelle also took home silver in the shot put with a best throw of 11.60m and gold in the high jump with a height of 1.51m. Meanwhile, MacDonald finished 2nd in the 60m hurdles with a time of 9.08s and 2nd in long jump with a distance of 5.40m. - Another Miramichi athlete, Rachelle Haché (UdeM), also competed in the weight throw and finished 3rd with a toss of 12m54 she also competed in the shot put and had a solid 4th place finish with a best throw of 11.39m. - Shawna McKay,of Moncton competing for Dalhousie, took home the bronze in the women’s 300m with a time of 41.85s. McKay tied for 4th place in the 60m dash with a time of 7.96s shared with St. FX Athlete Samantha Taylor of Canterburry. - Katie Robinson of Saint John (Acadia), had an excellent 2nd place finish in the 3000m with a time of 10:26.47. - In the Women’s 1000m race, Dalhousie athlete Michelle Reddy set a new AUS and stadium record with a new time of 2:52.72. Reddy also brought home gold in the 600m and 1500m. - Constance Gilman of Prince Edward Island ( UdeM) won the womens shot put with a throw of 11m69 and finished 2nd in the weight throw with a toss of 12m72. - Alain Doucet of Dieppe (UdeM) had a wonderful competition, with a 1st place finish in the men’s pole vault with a jump of 4.20m – matching his stadium and provincial record. He also finished 3rd in the heptathlon with a score of 4370 . - UNB athletes Braden Harrison of Fredericton and Tyrell Marin of Dalhousie took home silver and bronze in the men’s 300m dash, respectively. Harrison’s final time was 35.76s while Marin finished with a time of 36.24s. - Michael Colford (UNB) of Fredericton finished in 5th place in his 1000m race with a time of 2:32.60. Colford also competed in the 1500m and finished with a time of 4:04.84, earning him the Bronze medal. - Branden Cleghorn (UNB) of Salisbury had a best long jump of 6.31m which was enough to earn him bronze in the event. Cleghorn also finished second in high jump and third in triple jump. - Jarod Manuel of Bais Saint Anne (UNB) and Liam Turgeon of Tidehead (UNB) , both competing in the men’s shot put, secured 2nd and 3rd place finishes, respectively. Manuel had a best throw of 14.36m and Turgeon finished with 14.26m. In the weight throw, Manuel finished 3rd while Turgeon took home gold with a throw of 15.43m. - Antony Cormier of Saint John (DAL) captured a silver medal in the men’s triple jump with a leap of 12m98. He was also part of the gold medal 4x200m Dalhousie relay team. - Julien Leger of Acadieville (UdeM) was third in the mens triple jump with a jump of 12m43. - Jean Luc Bastarache (UdeM) finished second in both the Hepthalon and the Pole Vault. - Timothy Brennan of Beachwood (St-Fx) , finished 5th overall in the 300m dash with a time of 36.82s and took home a silver medal for his 60m hurdles with a time of 8.97s. - The men’s heptathlon saw several AUS records broken with Alain Doucet (UdeM) and Jean-Luc Bastarache (UdeM) vaulting over 4m and Audley Cummings(Dal) with a tremendous long jump of 6.74m. All three men broke/tied the AUS and stadium heptathlon record, but Cummings went away first 1st place with 4414 points overall. “This is always a great competition to watch as athletes are pulling off fantastic performances in an effort to qualify for the CIS Championships” said Gabriel LeBlanc, Executive Director of Athletics New Brunswick. “To all of the athletes heading to CIS Championships, we wish them all the best and we know that they will make New Brunswick proud,” added LeBlanc. The 38th edition of the AUS Track & Field Championships are set for this Friday and Saturday (February 23-24) at the Vance-Toner Stadium in the CEPS on the Université de Moncton campus. Teams from nine Atlantic universities will be represented by over 200 athletes. There will be several New Brunswick universities in action, including University of New Brunswick, l’Université de Moncton, and St. Thomas University. This competition will showcase several of New Brunswick's top athletes, with many looking to compete for medal positions and USport qualifying performances. On the women’s side, Victoria LeBlanc of Saint John is once again ranked 1st in the AUS in the long jump with a 5.37m leap earlier this month. Her teammate Brianna Forbes, hailing from Targettville, will be looking for a strong performance in the triple jump in her first year at UNB. Forbes is currently ranked 2nd in the AUS for triple jump with a best of 10.70m set back in January. Sydney MacDonald of Miramichi is currently ranked 2nd in the pentathlon with a score of 2971 points. On the men’s side, Tyrell Marin of Dalhousie will look to impress in the 60m sprint, coming off a 7.04 performance in Gagetown which ranks him 3rd in the AUS. He will also be competing in the 300m with teammate and fellow New Brunswicker Braden Harrison, who is ranked 2nd. Distance runner Michael Colford of Fredericton will be competing in the 1000m in which he is ranked 2nd. Branden Cleghorn of Salisbury will be competing in the high jump and long jump in which he is ranked 2nd and 3rd, respectively. The UNB men’s 4x200m relay team sits atop the table and will look to keep their spot this weekend, having ran a time of 1:32.87 this season. Jarod Manuel of Baie St-Anne is ranked 2nd in the shot put while teammate Liam Turgeon of TideHead is ranked 3rd. In the weight throw, Liam is ranked 1st while Jarod is ranked 3rd. Dieppe’s Alain Doucet, the provincial record holder in the pole vault, is ranked 1st in the pole vault with a best of 4.20m. Teammate and long jumper Julien Léger of Moncton is ranked 6th in the long jump. Isabelle Morris of Miramichi is ranked 2nd in the women’s shot put and 3rd in the pentathlon. Miramichi’s Rachelle Haché sits atop the AUS weight throw standings and is ranked 3rd in the shot put. Dieppe’s Sharon Nagano is ranked first in the pole vault with a best of 2.60m. Chelsey Hall of Fredericton is ranked 8th in the 600m and 11th in the 3000m. Shawna McKay of Moncton, wearing the gold and black of Dalhousie University, will be competing in the 60m and 300m. She is currently ranked 4th in the 60m and 3rd in the 300m. Timothy Brennan of Beachwood, competing for St-FX, will be racing the 300m as well as the 600m and 60m hurdles in which he is ranked 3rd, 1st and 2nd, respectively. Katie Robinson of Saint John will represent Acadia in the 3000m where she is currently ranked 2nd with a time of 10:31.48. The Championships start at noon at the CEPS of l’Université de Moncton campus and run until 6:10pm on Friday. Action continues on Saturday, starting at 9:00am and wrapping up by 2:30pm. You can also catch the action live on the through the AUS TV website (www.austv.ca). This summer we are once again looking for Athletics New Brunswick Regional Coordinators to deliver grassroots programming, provide help with track meets and coordinate the RJTW Series and assist with several other programs and events. Positions will be available in various locations across the province. We are also looking for Assistant to the Executive Director of ANB to organize and coordinate several tasks associated with the organization and its operations. Last Saturday, Laura Dickinson was part of the group of athletes sent to San Salvador, El Salvador for the 2018 Pan American Cross Country Cup representing Team Canada. The Cup hosted teams from the USA, Brazil, Mexico and several others – all sending their best and vying for gold. The U20 Women’s team dominated the Cup with Team Canada pulling off the podium sweep! Dickinson clinched second place overall with a times if 20:54.0 in the 6km race while teammates Brogan MacDougall and Martha MacDonald took first and third, respectively. These performances from the Junior Women secured their team top spot for the second year in a row. Team Canada had a great weekend at the Cup with medals for all 4 teams in attendance. The junior men’s team came away with gold after some great performances. The senior women’s team finished in a second place position (gold among NACAC countries) and the senior men’s team had a third place finish (silver among NACAC countries). "The junior women’s squad pulled off some amazing performances to sweep the podium and place first as a team” said Gabriel LeBlanc, Executive Director of Athletics New Brunswick. "Laura is an incredible young athlete and we are so excited for her and the team as a whole as Canada was well represented on the international stage!" The 2018 Pan American Cross Country Cup is set to take place this Saturday, February 17th in San Salvador, El Salvador. Athletics New Brunswick has a small, but strong athlete and coach contingent attending the cup in Laura Dickinson and Chris Belof. Laura is coming off of a tremendous 2017 season both nationally and internationally. After winning both the 3,000m and 5,000m steeplechase titles at the Canadian U20 Track & Field Championships, she went on to carry the flag for Team New Brunswick at the opening ceremonies of the Canada Games. It was there that she captured silver in both of her events. Her international presence last year was exceptionally strong, winning the gold medal for Team Canada in the 5,000m at the Pan American U20 Track & Field Championships in Peru. Now, she'll be racing on the Junior Women's team at the Pan American Cross Country Cup. Laura’s Junior Women’s teammates consist of Jocelyn Chaur of Toronto, Savanna Jordan of Calgary, Martha MacDonald of Toronto, Brogan MacDougall of Ontario and Lilly Tuck of Ontario. Chris Belof, ANB’s new High Performance Coach will be attending the cup as part of the coaching staff. This appointment marks his first Team Canada coaching experience. He will be joined by 4 other coaches selected from across the country including head coach John Lofranco of Montreal. The Junior Women's team is eager to defend their title from last year with a strong performance this weekend. "It is always exciting to have both an athlete and one of our staff members named to a national team as it really highlights some of our programs strengths” said Gabriel LeBlanc, Executive Director of Athletics New Brunswick. "We are really looking forward to watching Laura and Chris represent both our province and our country this weekend!" While some of ANB's top age-class athletes competed at the Canadian Indoor Championships in Montreal, three of our top senior athletes were in action at major competitons in the United States. - Genevieve Lalonde of Moncton, competing for Canada, ran a phenomenal 3000m, finishing 5th with a time of 8:49.78. This performance breaks Patty Blanchard's provincial record, set in 1993, by over 40 seconds and is the third fastest time in Canadian history, just over a second off the national record! The performance also dips under the IAAF World Indoor Championships standard of 8:50.00. - Jack Berkshire of Fredericton, competing for University of Toronto, won the 300m with a time of 34.12, a new provincial oversize track record in the U23 and senior categories. Berkshire also helped the Toronto relay team to finish 4th in the 4x200m with a time of 3:14.98. Andrew LeBlanc of Fredericton, competing for Guelph University, finished 3rd in the 800m and 5th in the 600m with times of 1:50.94 and 1:19.06, respectively. LeBlanc helped the Guelph relay team to finish 8th in the 4x200m with a time of 3:21.09. His 800m performance is a new provincial oversize track record in the U23 and senior categories and the fastest ever 800m run by a New Brunswick Athlete indoor. "These results serve as a testimony of New Brunswick's high performance capabilities," said Gabriel LeBlanc, Executive Director of Athletics New Brunswick. "Athletics Canada is expected to announce the World Indoor team later this week, we can likely expect to see Gen named to the team for the 3000m event." The Canadian Indoor Track & Field Championships took place this past weekend at the Complexe sportif Claude-Robillard in Montreal. Each year Athletics New Brunswick sends a team to the event, this year sending 37 of our province's top age-class athletes. The team captured 17 medals (6 gold, 9 silver, 2 bronze), 11provincial records, and a number of personal best performances. - Shelby MacIsaac of Riverview (ASEA) won silver in both the midget girl's 60m (8.12) and youth girl's 400m (58.02), and gold in the youth girl's 200m (25.52). Shelby's 200m time is a provincial record in both the midget and youth categories, while her 400m time is a record in the midget, youth, and junior categories. - Erin Vringer of Saint John (SJTC) won gold in both the youth girl's 1500m and 3000m with times of 4:45.36 and 10:28.62, respectively. - Sophie Black of Dieppe (ASEA) won gold in the junior women's pentathlon with a score of 2904. - Marie-Pier Cloutier of Saint John (SJTC) won silver in the junior women's 60m hurdles with a time of 9.42. - Kyla Hughes of Cocagne (ASEA) won silver in the junior women's shot put with a best attempt of 12.37m, breaking the 28 year old provincial record. Kyla's throw also bettered the former championship record, which was then claimed by the gold medalist who threw a best of 13.66m. - Joelle Leger of Dieppe (ASEA) won bronze in the junior women's 200m with a time of 27.86. - The New Brunswick junior girl's relay team captured silver in the 4x200m with a time of 1:49.51, narrowly missing the provincial record set at the same event last year. The team was comprised of Marie-Pier Cloutier, Robyn Davis, Joelle Leger, and Caroline Gagnon. - Jordan Henri of Moncton (ASEA) won gold in both the youth boy's 60m and 200m, finishing with time of 6.87 and 22.06, respectively. Both of Jordan's performances came with a number of additional records and rankings: his 60m time is a provincial youth record, his 200m time is a provincial youth and junior record, and both performances bettered the championship records. Not only is Jordan ranked 1st in the country among youth and junior athletes in both events, but his 60m time ranks him 7th in the world among youth athletes, while his 200m time ranks him 20th. - Michael Mitton of Rexton (ASEA) won silver in the junior men's pentathlon with a score of 2413. - Craig Thorne of Saint John (SJTC) won silver in the youth boy's 60mh with a provincial record time of 8.21. Craig's time was just 0.006 behind the gold medalist. - Alexandre Banks of Saint John (SJTC) won bronze in the junior men's 1500m with a time of 4:24.95. - The ASEA Youth Boy's relay team captured silver in the 4x200m with a time of 1:44.14. The team was comprised of Owen Enstrom, Tristan Morneault, Max Mazerolle, and Austin Wamboldt. -New Brunswick Junior 4x200m captured a Silver medal with a blistering time of 1:33.09. This establishes a new provincial record. The team was comprised of Kenneth McGovern, Craig Thorne, Mykyle Welsh and Jordan Henri. "What amazing results for some of our province's rising stars," said Gabriel LeBlanc, Executive Director of Athletics New Brunswick. "Aside from medals and records, our athletes achieved a number of personal bests and top 8 finishes." It is with heavy hearts that Athletics New Brunswick announce the loss of one of its members. Imrich Kiraly passed away unexpectedly earlier today at the age of 71, the result of a motor vehicle collision. The Yarmouth resident has been a member of the New Brunswick track and field community since 2011, a member of the Saint John Track Club. Born in Pilisszántó, Hungary and raised in Czechoslovakia, Imrich moved to Ontario in 1969, and then to Yarmouth in 1997. A competitor in Czechoslovakia, Imrich was named to the National Decathlon Team in 1968. At the 1970 and 1971 Canadian Track & Field Championships, Imrich won bronze in the decathlon. Competing as a master's athlete, Imrich won an extraordinary number of national medals, including two golds and two silvers in 2014. His achievements also include 13 provincial masters records, spanning across three different age groups, and an induction into the Yarmouth Sports Hall of Fame in 2017. Imrich was a valued member of our association and of the Saint John Track Club, always lending a helping hand and showing true sportsmanship. He will be dearly missed by the athletics community. An exciting weekend is in store for Athletics New Brunswick (ANB) as the Athletics Canada Indoor Championships are quickly approaching. On February 10th and 11th, a strong group of 37 NB athletes will be competing at the event in Montreal. For some this championships will serve as their first time on the national stage, while others are experienced competitors at this level. - Shelby MacIsaac (ASEA) of Riverview is ranked 1st in the youth girl’s 400m, 2nd in the 60m, and 4th in the 200m. - Owen Enstrom (ASEA) of Upper Coverdale is ranked 3rd in the midget boy’s 800m. - Erin Vringer (SJTC) of Saint John is ranked 1st in the youth girl’s 3000m and 5th in the 1500m. - Jordan Henri (ASEA) of Moncton is ranked 1st in both the youth boy’s and 200m. - Craig Thorne (SJTC) of Saint John is ranked 2nd in the youth boy’s 60m hurdle. - Francois Richard (ASEA) of Dieppe is ranked 3rd in the youth boy’s 3000m and 6th in the 1500m. - Joelle Leger (ASEA) of Dieppe is ranked 3rd in the junior women’s 200m and 4th in the long jump. - Robyn Davis (FFT) of Fredericton is ranked 1st in the junior women’s 800m and 5th in the 400m. - Marie-Pier Cloutier (SJTC) of Saint John is ranked 2nd in the junior women’s 60m hurdle and 5th in the 60m. - Kyla Hughes (ASEA) of Cocagne is ranked 1st in the junior women’s shot put. - Sophie Black (ASEA) of Dieppe is ranked 1st in the junior women’s pentathlon. - Alexandre Banks (SJTC) of Saint John is ranked 2nd in both the junior men’s 800m and 1500m. Athletes will be supported by a coaching staff comprised of Gabriel LeBlanc of Dieppe, and Peter and Alex Stuart, both of Riverview, and two team managers in Alex Coffin and Julia Laparco of Saint John. The New Brunswick Indoor Track & Field Championships took place in Oromocto this past Saturday. With over 125 athletes competing, there were fantastic results, including 12 provincial records, and even 2 Canadian records. - Patty Blanchard of Dieppe set a new national master's record in the women's 60-64 1500m, running a phenomenal time of 5:26.66. Patty's performance betters the national record by over 20 seconds. - Robert Jackson of Fredericton set a new national master's record in the men's 60-64 5000m with 18:06.42. - Erin Vringer of Saint John broke the provincial midget record in the girl's 3000m, finishing with a time of 10:17.96. This betters Laura Dickinson's former record by almost 10 seconds. - Shelby MacIassac of Riverview ran an incredible 400m, clocking a time of 58.40 and breaking the provincial records in the midget, youth, and junior categories. - Jordan Henri of Moncton continued his winning ways, breaking his own youth 60m provincial record with a time of 6.93. This is the fastest time run by a U20 athlete in Canada this season. - Craig Thorne of Saint John broke his own record in the youth 60m hurdles, finishing with a time of 8.34 to break his former record by just 0.03. - Rebecca Lagacé of Saint John broke the provincial master's record in both the women's 40-44 shot put and weight throw, with best attempts of 7.92m and 8.72m, respectively. - Bruce Rosvall of Saint John broke the provincial master's record in both the men's 50-54 200m and 400m, running times of 26.86 and 58.95, respectively. Saint John Track Club won the team banner with a total of 263 points, while Fredericton Fast Tracks finished seconds with 198 points, and Fredericton Legion Track Club third with 142 points. "Our province's athletes have once again shown that they are prepared to reach top form and challenge for national results," said Gabriel LeBlanc, Executive Director of Athletics New Brunswick. "To see two national records was also a nice surprise and serve as testimony to our province's strong field of masters athletes." Many of New Brunswick's top midget, youth, and junior athletes will be competing at the Athletics Canada Indoor Championships next weekend in Montreal.